The best thing to do would be to go home and lie down until everything was back to normal. Whatever was in the jasmine tea might take a few minutes to kick in properly and I didn’t want to start tripping in the middle of town. Then again, my case was starting to make more sense. Obviously whoever had hired me wanted me to get hold of whatever was in that tea. But that seemed too obvious. The guy who paid me looked like the kind of guy who wouldn’t think twice about smashing his way into The Caffe Noire and taking it for himself. No, it had be something else. I guess I really would know it when I saw it. Talking of seeing things, everything still looked reasonably normal. The streets were still practically deserted and the shops were still inexplicably open. Maybe I’d just overreacted? Maybe there wasn’t anything hallucinogenic in the tea? It was possible that there was a perfectly logical explanation for all of this. And then I saw the cathedral. If that was even the right word for it. It towered above the high street like a crooked grey giant, standing where the old Ottoman Books shop had been. Every one of it’s spires was as crooked as a tree branch and was circled by rusty iron bands. A flock of gurning reptilian gargoyles perching on the edge of the roof stared down at me with dead stone eyes. 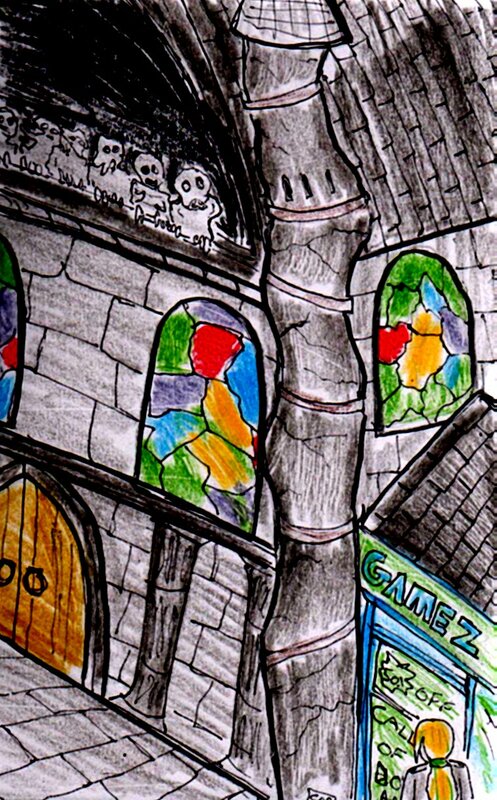 Even the stained glass windows looked like that they’d been stitched together from the shattered remains of ten other windows. Although it couldn’t have been here for more than an hour, it looked like it had been born and died on this particular spot. This had to be the tea, it had to be a hallucination. Obviously, my subconscious mind had picked up on how large the new Firestone’s Bookshop which had replaced Ottoman Books had been. No doubt the tea had allowed my subconscious to overlay an image of an old cathedral from a horror movie on top of it. It was nothing to worry about, I was starting to hallucinate. That was all. I should go back home and lie down until whatever was in the tea had worked its way out of my system. But, I decided to go inside instead. There was something about it which just seemed too real to be a hallucination. Maybe it was all of the small stone carvings around the entrance or the realistic shadows on the walls? I couldn’t quite tell what it was, but there was something real about this place. So, as a detective, it was my job to look into it further. Maybe I’d even find what I was supposed to be looking for. Whatever that was. The warped wooden doors creaked open slowly and I found myself face to face with nothing but darkness. For a second, I felt self-conscious. A part of my mind knew that I was probably just standing in the doorway of Firestone’s and looking at everything with a thousand-yard stare. It’d probably take a minute for everyone to notice me, but one of the assistants would probably eventually ask if I was ok. Maybe they were doing it right now? After a while, they’d probably either call the police or call an ambulance. Maybe I’d even end up in the local paper? It was, after all, obviously a slow news day like any other. I stared into the void for a few more seconds before deciding that the sensible thing to do would be to come back later with a torch. If the cathedral was still standing tomorrow morning, then I’d take a proper look around. So, I turned around to go home and tried not to notice the worn flagstones beneath my feet as I left the cathedral. Yes, they were just slightly too realistic, but it could still have been part of the hallucination or part of the pavement.